The 56Z truck-mounted concrete boom pump provides the reach and pumping capacity for commercial construction sites in a compact design that improves maneuverability and job site versatility. These 56-meter concrete boom pumps are manufactured with only high-quality products and are designed with innovative features to make them the ideal concrete pump for every situation. At under 100,000 pounds, this five-section boom pump delivers a lightweight solution in the 50-meter class providing a vertical reach of 180 feet, 10 inches and a horizontal range of 163 feet, 10 inches. Our 56-meter concrete boom pumps are capable in medium to large commercial concrete projects. The Ergonic technology of the 56Z raises the bar in control and delivers increased efficiency and flexibility. A single, modular system provides a variety of benefits ranging from improved reliability, more accurate concrete placing, lower operating costs and extended service life. Ergonic Boom Control (EBC) increases the precision control and placement of the boom while the Ergonic Pump System (EPS) ensures the pump and related functions are optimized for the task at hand. When you have a job that calls for a larger pump, our 56-meter model is ideal for reach concrete pumping in a range of operating environments. The five-section boom and extended reach allow for pumping over and around construction site obstacles and hazards and deliver concrete to confined spaces and elevated locations. 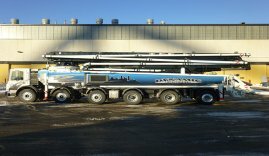 From high-rise projects and significant warehouse and industrial slabs to elevator shafts and core walls, this concrete pump with a 56-meter boom is capable of getting the job done efficiently. Contact us online for more about our concrete boom lifts and to inquire about our equipment and pumping services.